I am excited to be releasing a new album on the 1st May. 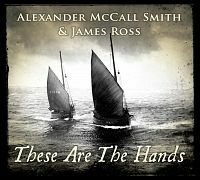 I have collaborated with author Alexander McCall Smith to create These Are The Hands – a celebration of Scotland, the sea and the land. The songs are performed by singers Michelle Burke and Kathleen MacInnes. You can pre-order the album now! I am really looking forward to attending a 5 week composition residency at the Banff Centre, Canada. I am excited to spend time working on some new music at the Leighton Artists' Colony, which is located in a secluded, wooded area on Banff Centre's 43-acre campus. The residency takes place during October and November 2016. Welcome to my new website! Please have a look around, listen to some music and enjoy the stunning photographs from the Johnston Collection.